What is Khao Lak Active ? Summer in Khao Lak, The interview with Richard Doring. Richard Doring is the author of 'Loose fuhrer' the German travel guide book of South Thailand. Richard Doring also comes for more than 20 years to Khaolak. Khao lak Heute: Mr. Doring, you spent the last 8 summers in Khao Lak. What is it that makes you love this time of the year so much? Professional booking service for our partner hotels. Booking of activities. See our activities page. Tours and trips. We have our own tour counter. Tourist information. See also our Khao Lak website. Click here to see maps of the holiday region. The holiday Region is Khao Lak and Bang Niang. If you up for it, you go all the way to Pak Weep, Pakarang and Bang Sak ! Khao Lak Active photo gallery. View our photos, all from the 'green' low season. It is so nice out here ! Thunmnails to small ? Click in the image to view in a larger size. Thai Cooking classes in Suwan Palm Resort. Learn how to create delicious thai food and learn also about thai ingredients. Go shopping with the chef cook at the local market for ingredients ! 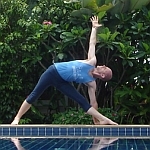 Yoga classes in Seaview Resort. Learn Yoga from William Holtby. William is giving yoga classes to beginners and advanced. Discover what yoga can do for your body ! Mountain Biking Tours. Bike around Khaolak, Thai Muang and more places. Learn about local life and see local people with traditional skills. This weeks' special activity is our thai cooking class. Our thai cooking class is being held in our partner hotel Suwan Palm Resort in Khaolak at Nang Thong Beach. Learn how to make Thai Curry, Sweet and Sour Chicken and Spring Rolls !